When it comes to dental implants, cost is often a deciding factor. Although the American Academy of Cosmetic Dentistry (AACD) states price is not always important when it comes to achieving that bright smile, it does play a significant role for certain people. In a weak economy, cosmetic surgery may not be seen as a necessity. But at the same time a healthy smile is often associated with success, intelligence, and could even help you land a job, and earn more money! In essence, the quandary boils down to this. How much are we willing to pay for replacement teeth? Are dental implants cost effective? Is the overall expense comparable to other types of cosmetic dentistry? A dental implant is a surgical procedure. A team of dental surgeons performs it. This automatically increases the cost. 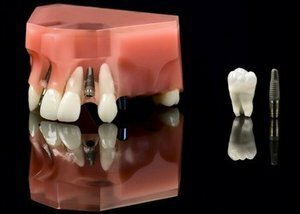 Dental implant procedures involve implanting a metal post and an accompanying artificial tooth into the space formerly occupied by a natural tooth. The rods act as roots and help anchor the replacement in place. A neighbor of mine had to get four dental implants, more for medical necessity rather than cosmetic reasons. However, part of the final look would be visible when he smiled, so aesthetics played a role. When he shopped around, the average quote was about $18,000. In addition to the four implants, he needed a bone graft in his jaw, and to remove an existing bridge that was in bad shape and causing the health issue. He settled for going to a local dental university to get the work done for about half the cost. Even still, dental implants cost a bunch. Although it worked out for my neighbor, this option is not convenient or available to everyone because most people don't live by a dental school. And for the discount, he had to give up certain conveniences and settle for less. He had to wait much longer (endure the discomfort for longer) to get the work done; take more time off from work to get to the university, deal with parking, and walk longer distances to reach his appointments; and he worked with a younger and newer dentist. The most common types of dental implants are endosteal and subperiosteal. The former involves surgical insertion of various objects into the bone. It is the most common method of implant in use today. The latter does not embed into the bone. Rather, the implants sit on top of the jaw. The metal posts comprising the implants base protrude through the gum, instead. The implants may be "stand-alone" procedures. They may also form part of another procedure. In particular, this refers to bridgework or dental implant dentures, including partials. Age and bone condition may also affect the cost of dental implants. It coiuld increase the price by creating the need for further treatment or additional steps in the procedure. Typically, dental implants cost more than dentures or bridges. The prices fluctuate but typically go upwards from $3,000 in the U.S. This may make them less affordable to many people. But the true cost, according to many dentists, is not only the financial one. Reliability, confidence, comfort, quality, and freedom are all qualities that implants can offer. Moreover, a case can be made that dental implants are actually more cost-effective than other dental cosmetic procedures currently available. In other words, over the long term, implants may cost less in terms of maintenance and overall tooth and face structure integrity. There is no denying that dental implants cost more than other forms of cosmetic dental surgery. Yet, appearances can be deceiving. If the overall cost including impact, potential decrease in future loss teeth, and reconstructive facial surgery is taken into account, implants can often be more cost-effective. Whether this is true will depend upon such circumstances as physical condition, oral health, and personal economics. Consider all factors and if dental implants are the best option for you. Are you getting implants soon? Did you get them? Discuss below!